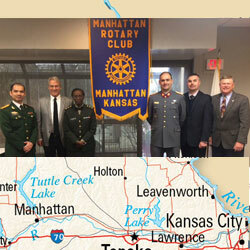 CGSOC students present at Manhattan Rotary Club program | Command and General Staff College Foundation, Inc.
John Cary, an assistant professor in CGSC’s Department of Joint, Interagency and Multinational Operations (DJIMO), recently escorted a group of CGSC students to Manhattan, Kansas, to present an informational program about the Command and General Staff College at the Manhattan Rotary Club (MRC) during their membership meeting. From left, Capt. Hieu Le from Vietnam, DJIMO Professor John Cary, Capt. 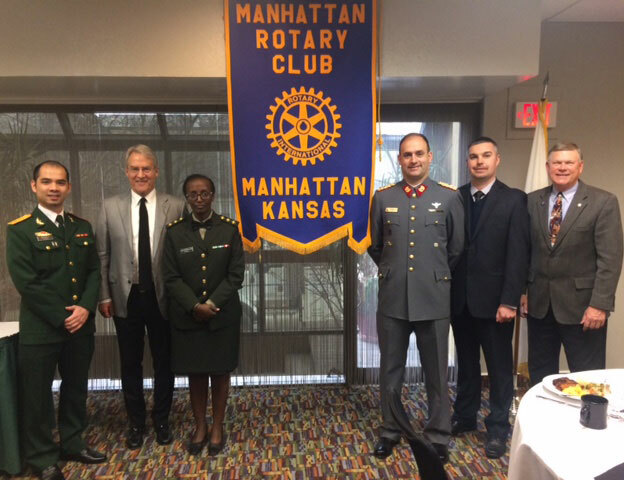 Lausanne Nsengimana from Rwanda, Lt. Col. Enrique Reboler from Chile, Brian Hamil, interagency student from the Defense Intelligence Agency, and Manhattan Rotary Club President Vern Henricks, at the MRC meeting in March 2018. Cary said he was responding to an invitation from the club to repeat a similar “program” he had provided a few years ago with three international officers. He said he repeated that same approach for this presentation with the exception of adding an interagency student to the mix. The students that accompanied Cary were Lt. Col. Enrique Reboler of Chile, Capt. Hieu Le from Vietnam, Capt. Lausanne Nsengimana from Rwanda, and Mr. Brian Hamil from the Defense Intelligence Agency. Cary kicked off the presentation by outlining the mission of the College, highlighting its uniquely large, diverse, and highly successful international military student program that annually brings some 120 foreign officers from approximately 90 countries to CGSC for an opportunity to learn about America, Americans, and the U.S. military. 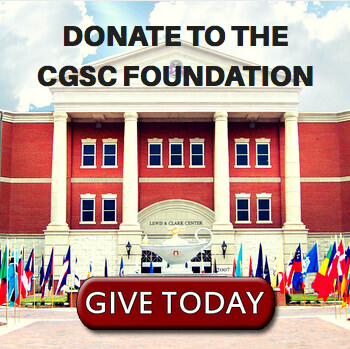 Cary then introduced the officers and each spoke briefly about their experiences in CGSC and the U.S. in general. “Our students are so impressive that all I basically have to do is show up,” said Cary. “Not surprisingly, [the students] were terrific representatives of this College and their home countries/organizations. 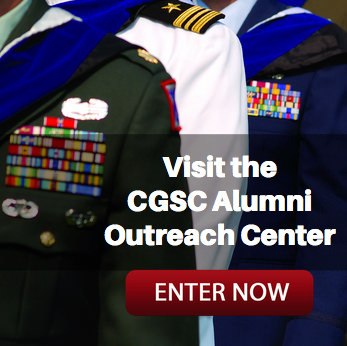 Cary said the students were all volunteers and endorsed by their respective CGSC small group advisors. After the meeting MRC member Betty Stevens sent an email message, endorsed by MRC President Vern Henricks, to Cary in appreciation for the program.